(Editors Sue Colyer & Francis Lobo ). The 5th Biennial International Conference of the Australian and New Zealand Association for Leisure Studies (ANZALS), in conjunction with the 3rd Women in Leisure International Conference, Fremantle, Western Australia. 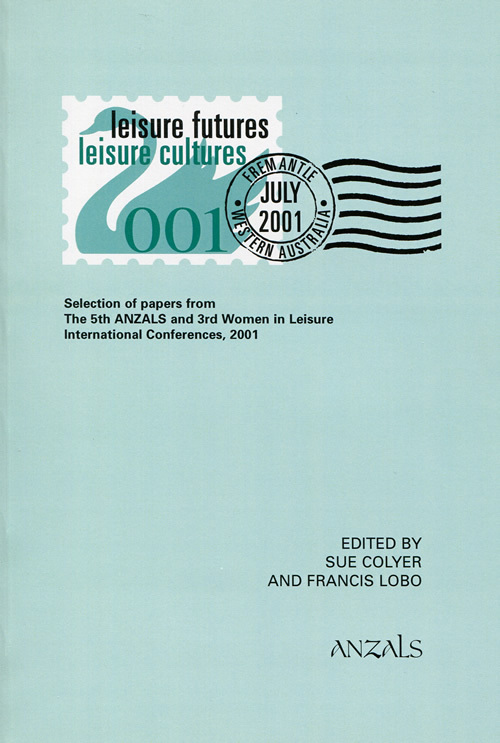 The theme of the conference was Leisure Futures, Leisure Cultures. The location of the conference reflected the theme. Fremantle offered delegates a unique experience of history, culture and a glimpse of the future. This edited book contains fourteen articles carefully selected from over 100 refereed papers, poster and workshop presentations made over a five-day period . Leisure remains prominent in the lifestyle debate and these the papers address the increasing demands on modern society to achieve cultural diversity and harmony in constructed and natural environments. The book contributes to understanding the future of leisure in its many forms and diverse cultural perspectives. This publication focuses on leisure through the lifespan; leisure tourism and the outdoors; and leisure and cultural issues. The section on leisure through the lifespan has four articles that deal with leisure experiences in mid-life, retirement, role-modelling for teenage women, and the relationship of public space to identity and personal leisure management of young women. The mid-life study examined the stability of leisure attitudes and perceptions. This is followed by definitions and experiences of how leisure was defined and experienced by retirement-aged women. The third paper found that role models of teenage girls were determined by their domain of interest. Finally, it was found that local public spaces were important to young women for social interaction as well as safe and accessible settings in which to take some risks. Five articles are presented in the section on leisure, tourism and the outdoors. The first paper examined the complex interconnections between the processes of migration, urbanisation and patterns of tourism. The second is an article that attempted to build a model using the positive aspects of eco-tourism. Concern about sustaining small neighbourhood parks was the subject of the third paper, but conjoint analysis was suggested as an avenue to solve the problem. The fourth paper in the section reflected on the leadership and early administration of national parks in New South Wales. The last paper promoted the idea of specific education programs that were necessary for appropriate visitor behaviour when interacting with wildlife in parks. Five papers are presented in the section on leisure, tourism and the outdoors. The first paper examined the complex interconnections between the processes of migration, urbanisation and patterns of tourism. The second is an article that attempted to build a model using the positive aspects of eco-tourism. Concern about sustaining small neighbourhood parks was the subject of the third paper, but conjoint analysis was suggested as an avenue to solve the problem. The fourth paper in the section reflected on the leadership and early administration of national parks in New South Wales. The last paper promoted the idea of specific education programs that were necessary for appropriate visitor behaviour when interacting with wildlife in parks. ISBN: 1 876394 07 2.